Kits to make unique jewelry, ornaments and gifts with beads, wire and some unique handcrafted componenets! Beads and Wire, Polymer Clay and Findings... Your Imagination makes our Craft Kits Unique! Want a kit combination you don't see here? We'll be happy to make up a group kit just for your special occasion! By Professional Artists. Because your project can only be as unique as the materials you use. All of our TWISTED KITZ kitz contain materials needed to create these pieces and are designed to encourage creativity and exploration, that's what gives these kitz the twist! The The Vintage Treasure Montage recycles vintage jewelry pieces into pendants and pins. Includes everything you need. Each kit is one of a kind. Available in 2 versions, plus you can buy the filigree bases and bags of "vintage bitz". Kit details and contents. Easy to Make Decorative Hair Clips for all Ages. 3 different designs to choose from. Welcome Spring!!! 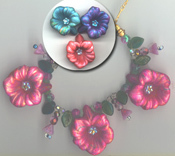 The Hybrid_Hibiscus Necklace, is now offered as a kit, complete with crystals, pressed glass flower and leaf beads, eye pins, connector beads and instructions. You can also purchase it with the beading wire, chain and spacers included. Charm Bracelet Kit Make a quick and fun stretchy charm bracelet that's as colorful as is it is easy to make. The Twisted Cab/Camo kit: Aluminum triangular shapes are fabulous bases for small gift projects. Pearls, digital design papers, aluminum, settign sugggestions...Shape inspires interesting designs. Filigree Flutterby-- Filigree winged mythical creatures make great pins for any age, all materials included, and those more experienced craftesr can add metallic paint and much more to create quite a magnificent pin for any occasion. The Frilled Lizard Kit--Add some drama to your outfit (and some great giggles too!) Wire lizard on your shoulder? Why not! 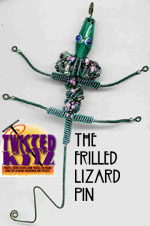 This kit gives you wire and beads (plus adorable polymer clay head bead) to make one totally, terminally cute lizard that will make anyone smile!! Easily made and fun to wear! Leave off the pin back and use it for all kinds of suprises...great fun in a indoor garden, brazenly sitting on a lampshade, or just adorning your office! Change Guardian-- Contains a basket, padlock, and directions to make a suitably threatening serpent. Head, tongue & glass treasure also make up the kit. Little Dragon Bracelet and Ring Kit. Quick, easy and adorable! Make a fun matching stretchy bracelet and ring with eyes. Includes all you need to make the set. Twisted Earrings-- Earrings are no longer a bore! With this kit you make three pair of truly unforgettable and fun pair of earrings. Combining glass seed beads, dyed freshwater pearls and our included colored wire coil, you can make a light, airy, swirly and unique pair of earrings that are unforgettable. Each kit makes 3 pair. Kit details and contents. Workshop/Party pricing! Get 30-40% discount for groups. Starting with a polymer clay torso bead and a creative mind, make a fully functional marionette that you can dress in costume, add extra features and then put on a show! Her head and legs are beads, arms are chain with ribbon woven through the links. Holiday Wreath Earrings-- Make these darling little holiday wreaths (about the size of a soda bottle top), quickly and easily with this kit. Easy to make with beads & wire included. Comes in holiday colors of red, green, silver & gold. 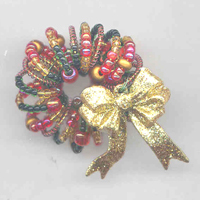 Wire Holiday Wreath-- These tiny wreaths make the perfect lapel pin and are quick and easy to make. Perfect for holiday gift giving. One kit makes six wreaths. Kit makes 6 with Wire on Fabric and Charm Bows $25 Workshop/Party pricing! Get 30-40% discount for groups. We got 2 (count 'em) two different holiday ornaments that you can make, both fun, funky and reasonably priced. One is our "wishing star" ornament which has a "star" jaws clip and can hang from a collar, your hair or your dog if you so choose. The other is a redux of our famous (and really hot) photo/cardholder ornament that lets you hang your favorite photo or card from your tree, your wreath or even your office lamp! 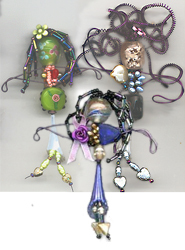 Our Wired Woman series is great for gifts, parties and looks different each time you make one. All kitz have alterntive design suggestions, and come packed with all the materials you'll need to make a complete "Wired Woman". Wired Woman kits have workshop pricing, many options. Get more details. The Giftopper Instead of putting a throw-away bow on your next gift, make a giftopper. It's a combination of dragonfly and bow, Uses metal-edged ribbon, and pulls off to become a pin, ornament or barette. The Photo Holder-- Small but decorative, this free standing photo or note holder makes a great gift and can be done in a few hours. The CD Evening Bag Recycle with style! Using CDs and some clever design, make a fabulous evening bag that will make a statement! You have several assembly choices that produce VERY differetn results. From a '20 flapper style bag to a thoroughly modern design statements... it is up to you. Great kit for teens and tweens! Kit contents and details, plus other options. Elemental/Nymph Head kit comes in 4 hair colors, green, blue, magenta and black. Fun and pretty easy, it comes with either a pin back or a horizontal hole for stringing. This kit is great for your leftover small beads! Hair available separately. Get full details. GOT A PARTY TO PLAN FOR? For Girl Scouts to Teen get togethers, check the group kitz button on each kit page. to help you have some fun. We've got special pricing for groups to make that scout badge or special party an easy one to manage. And each person goes home with a finished piece!! Order a kit today! Our Group Kitz gives your group of 8-12 a chance to share necessary tools, and get full kitz for a great price! Shipping discounted on purchases over $200. $10 added to orders under $30. Fees and discounts are included in shipping total. Check out the latest fabulous find see what's new for altered artists and stop by our new vintage strands section.